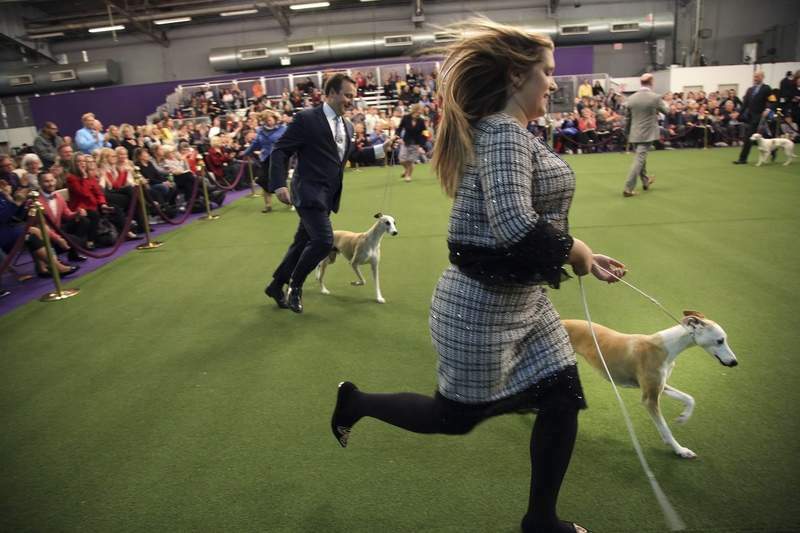 Associated Press Cheslie Pickett Smithey runs with her whippet Bourbon while her husband, Justin Smithey, runs with Whiskey at the Westminster Kennel Club dog show on Monday in New York. NEW YORK – Straight up, this was a Westminster Kennel Club surprise: Bourbon over Whiskey. A big-winning whippet was bounced from America's top pooch pageant Monday – knocked off, in fact, by his sister. Whiskey had won the prized National Dog Show televised Thanksgiving Day and the prominent AKC event New Year's Day. But his bid for a Triple Crown of dogdom ended when he was topped by littermate Bourbon in the breed judging. “She's the new kid on the block,” handler Cheslie Pickett Smithey said. Bourbon advanced to the hound group competition at Madison Square Garden on Monday night – where he lost to Burns the dachshund. This is the 143rd edition of America's top dog competition, and no dachshund has ever walked off with best in show. A crowd pleaser, the longhaired dachshund and handler Carlos Puig hugged in the middle of the ring after the victory. “Dachshunds are the best breed in the world,” Puig told fans. There were 76 dachshunds entered at Westminster in three varieties. Dachshunds are among several popular breeds that have never won this event – golden retrievers, Labs, Chihuahuas and Dalmatians have been shut out, too. Bono the Havanese has won the toy group at Westminster, besting Biggie the popular pug. The herding and nonsporting champ also were competing. For the fourth year in a row, a Labrador retriever named Heart took the obedience title Monday. More than 2,800 dogs in 203 breeds and varieties were entered. The best in show will be picked today. For Pickett Smithey of Sugar Valley, Georgia, Bourbon's win was bittersweet.